My day usually starts on my way to work by writing a tweet or Facebook post about something that’s happening that day. This can be anything from the weather to the Oscars envelope mix-up, and I have a lot of flexibility to tweet stuff in the moment as and when it happens. We do this because we want our social channels to be genuinely interesting and entertaining accounts that people want to follow. I’ll spend most of my working time producing content for campaigns that support our bigger marketing activity, like #SowAndGrow (above), The Big Knit or the launch of a new drink. I work really closely with our in-house creative and PR teams to make sure we’re all saying the same thing at the same time, and so we can share any great press coverage or blogger activity with our drinkers. At the heart of it, our team exists to look after our 'drinkers', so the team and I also dedicate a good chunk of time to our traditional and digital customer service, making sure we get back to everyone who gets in touch, and that our response is personal to them and genuine. Which social media accounts do you manage? 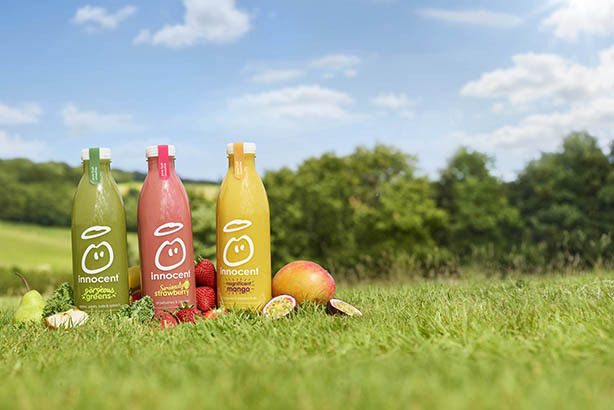 All of innocent’s social feeds – predominately Facebook, Twitter and Instagram. @innocent Hi guys, as smoothie experts, please settle an argument for me. What is the difference between a milkshake and a smoothie? Milkshakes - bring all the boys to the yard. Which channels work best for the brand & why? It’s a tie between Facebook (below) and Twitter (above) really. We have a lot of success on Facebook, and our posts are widely shared there, so we get a lot of cost-effective reach. Our brand naturally fits best on Twitter, because it’s the place where we can react to what’s going on in the news and entertain our followers with our nonsense, and have proper two-way conversations with people. Some people get in touch with genuine customer service questions, but most of the time we’re just having great chat with people – so it gives us the space to have a bit of fun and really show people what innocent is all about as a brand. Only put stuff out there that I find genuinely interesting or entertaining. If I would be embarrassed to show my friends it, I wouldn’t post it as innocent. If your social media manager is writing the stuff you put out there, then they need to understand what their brand is all about, and to be a great writer. You can talk about "optimisation" and "engaging content", but if the person writing isn’t a writer, then nothing you say will be any good. They’ll need to understand digital and how to get your content out there in the right way, but all of that stuff can be learned along the way. It would be easy for me to say something like, "that time that we got loads of retweets for this" or "when we got a shedload of likes for that" – but the best times I’ve had doing my job is when I’ve been having brilliant conversations with people. I’m always impressed by how consistently intelligent and hilarious our drinkers are, so even after a few years of doing this job, they always make coming into work every day a joy. I’ve posted a few things I probably shouldn’t have in my time, but nothing that’s got me in any serious trouble. Yet. In terms of strangest experience – there have been quite a few of those. On the day of the General Election in 2015, I went to vote on my way to work and there was a dog outside the polling station – so I decided to start #DogsAtPollingStations (above). People loved it, and it spiralled completely out of control really quickly. Soon people were taking their dogs down to the polling stations just to get in on the hashtag. It was covered in every national and loads of international press too (although most people didn’t know we’d started it) – and was massive again on Brexit day, and in the Australian election. Pretty much all of our good ideas happen by accident, and that’s a perfect example of just trying something out and seeing what works.